Happy New Year! Oh my! We had the BEST TIME this year when we decided to turn our annual Christmas party with my best friends into the first annual Couples Olympics. 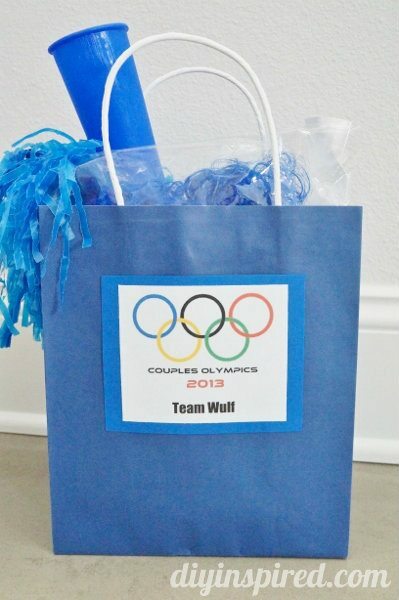 Of COURSE I had to get creative with it so I wanted to share my Couples Olympics Games and Ideas. 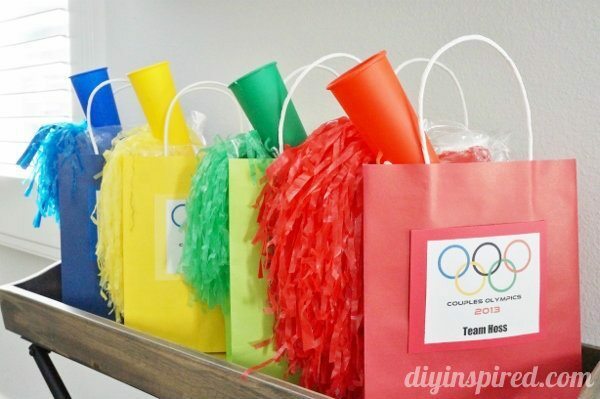 UPDATE: Check out our 2015 Couples Olympics Party and the Couples Olympics Party Tutorials! 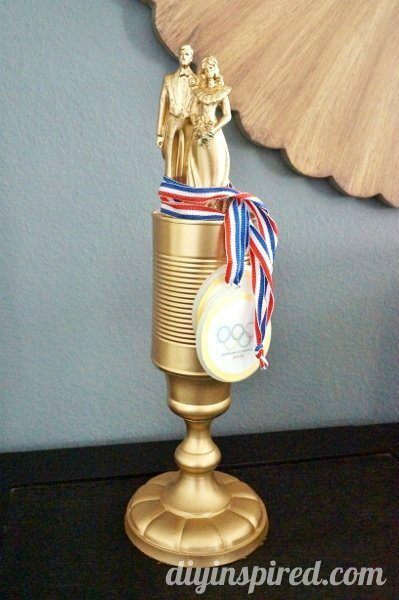 First of all, what would an Olympics be without a trophy and medals??? I had to make my own. 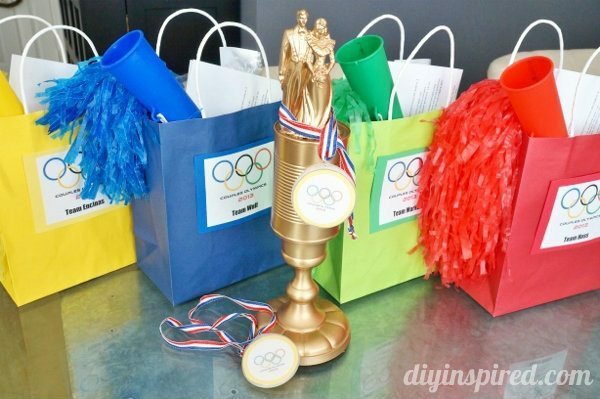 I found a make your own medal kit at a teacher supply store to make these for the winning couple. 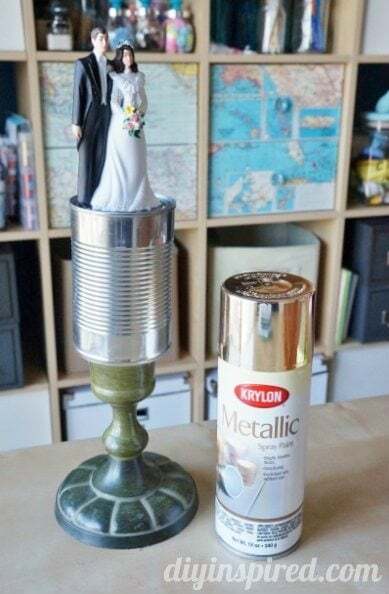 For the trophy I used a wedding cake topper, a can of garbanzo beans, and a candle stick and glued them together with E6000 . I let it set over night and then spray painted it gold. Tah dah!!! 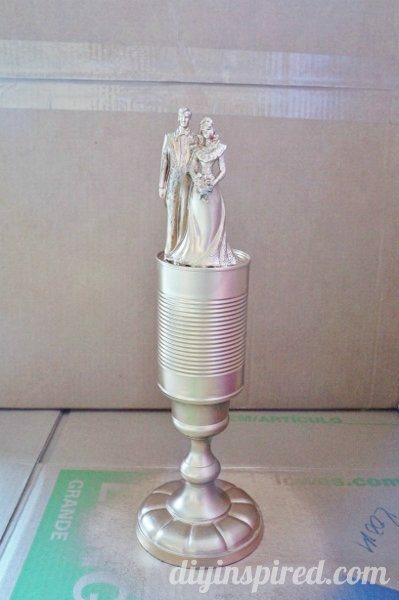 Instant Couples Olympics Trophy! Then, my husband said we needed an orientation packet. I decided to make these bags up for each team. 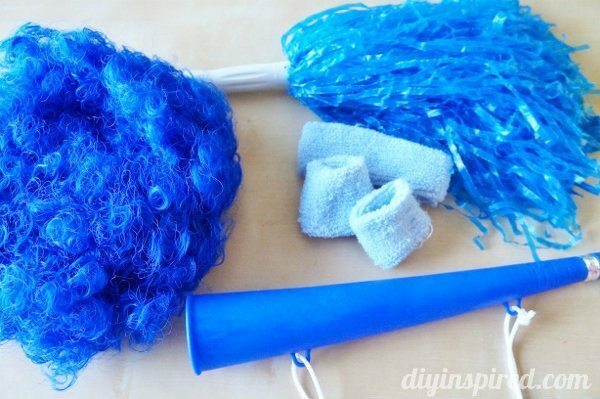 I filled it with a team wig, two sets of headbands, two sets of wrist bands, a horn, and pompom. We also put in the rules and regulations (which I’ll share below). We had six events including cup stacking. It was SO MUCH FUN!!!! 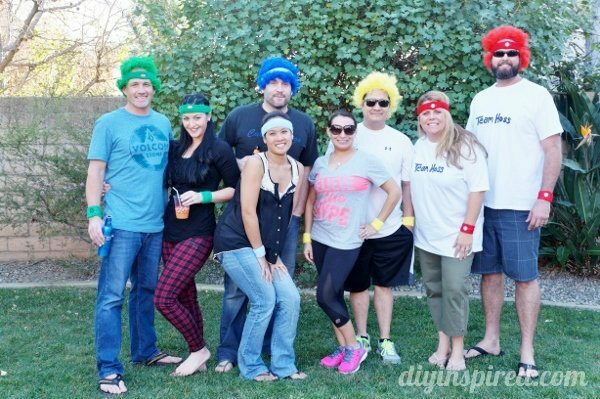 Here is a photo of the couples that participated. One team member from each team will participate in each game. Each team member must participate in three of the six events. Any derogatory statements about the amount of Chicago Bears paraphernalia in the home team’s house will results in -2 pts. The winning team of each event will receive 3 pts., second place 2 pts., third place 1 pt. and fourth place -1 pt. 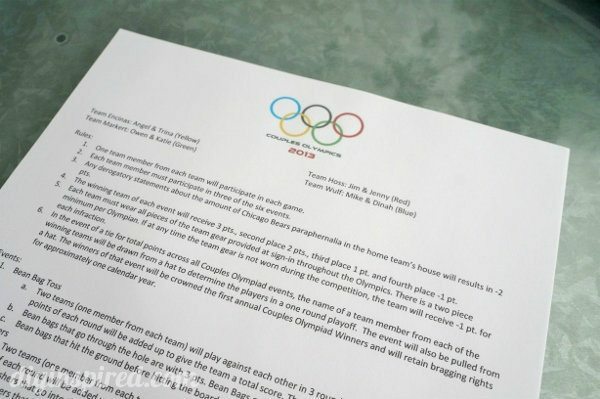 Each team must wear all pieces of the team gear provided at sign-in throughout the Olympics. There is a two piece minimum per Olympian. If at any time the team gear is not worn during the competition, the team will receive -1 pt. for each infraction. In the event of a tie for total points across all Couples Olympiad events, the name of a team member from each of the winning teams will be drawn from a hat to determine the players in a one round playoff. The event will also be pulled from a hat. The winners of that event will be crowned the first annual Couples Olympiad Winners and will retain bragging rights for approximately one calendar year. Two teams (one member from each team) will play against each other in 3 rounds of bean bag toss. The total points of each round will be added up to give the team a total score. The team with the highest score wins. Bean bags that go through the hole are with 3 pts. Bean Bags on the board are worth 1 pt. Bean bags that hit the ground before hitting the board do not count. Two teams (one member from each team) will compete against each other in 3 rounds of washers. The total points of each round will be added up to give the team a total score. The team with the highest score wins. Washers that go into the hole are worth 3 pts. Washers in the box are worth 1 pt. Washers that bounce on the ground before going into the box or hole do not count. Two teams (one member from each team) will compete against each other in 3 rounds of football toss. The total points of each round will be added up to give the team a total score. The team with the highest score wins. Football that land on the top row are worth 1 pt, 2 pts for the middle row and 3 pts for the bottom row. Footballs that bounce on the ground before hitting a row do not count. Each team (one member from each team) will have 16 cups. 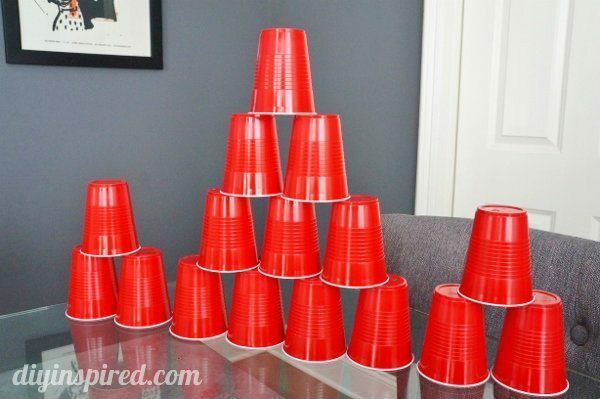 Build a 10 cup pyramid and two 3 cup pyramids and then take them down. When you end you must have all cups in one stack. All teams will compete against each other in a round robin competition. Each team (one member from each team) will have to answer five Christmas trivia questions. You receive 1 pt for each right answer and -1 pt for each wrong answer. Each team (one member from each team) will play against the other players in a round robin style game of Black Jack. Each player is playing against the house. The house will play typical Black Jack rules. i.e. – Dealer must hit on a value under 17, dealer will stay on 17 only if they have a face card and stay on anything over 17.
love this idea for a couple’s party. what is the washers game, though? Thanks, Patti! The Washers game is a lawn game. There are two wooden boxes with a hole in the middle that are set about 25 feet away from each other. You throw large washers and try and get them into the box for points and you get more points if you get it in the hole. A lot of people make there own or you can buy them online. Where did you find the stuff for the bags ?? Hi Melissa! You can find it all at party supply stores like Party City. Love the trophy! 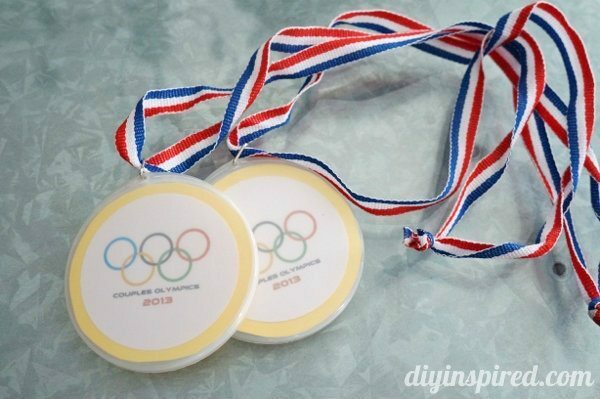 How did you make the inside of the medals with the Olympic symbol? I am having trouble finding one online that is small enough.